What a busy weekend with all the Halloween festivities and a big ONE year old birthday party. I can't wait to go through the pictures! For Made it Monday this week I thought I would show off some little bows I made for Savvy last year. I orginially got the idea while playing around with the hairbow tutorial from NutMeg Designs. I loved her idea but needed something more lightweight for a newborn. These are great for the fall/winter and they are very light weight so they work well in really new hair! The first thing I did was hot glue ribbon to these little clips. I bought them at a hair supply store. 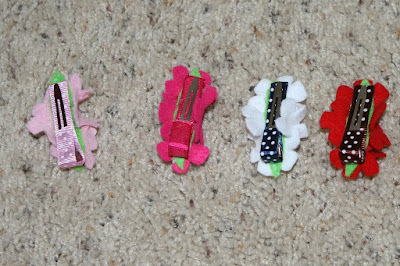 Then I cut out four little identical flowers out of felt and one long skinny green leaf (slightly larger than the length of the clip). Then I took some cross-stitch thread and sewed one flower in the middle of the leaf and one flower to each side of the middle flower attaching them all to the leaf. It doesn't matter what the back of the leaf looks like because the next step is to hot glue the leaf to the top of the ribbon on the clip. All done! 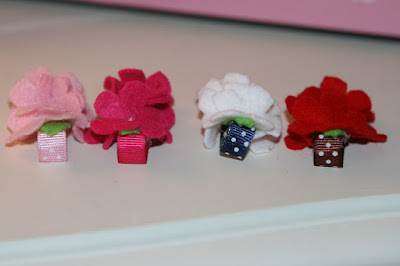 Really easy and fast to do; make one for every outfit. 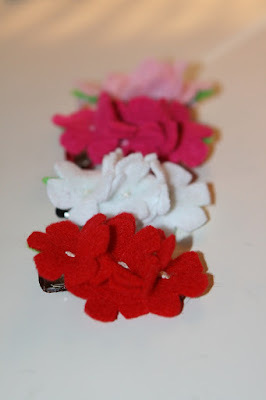 My little one hardly notices that they are in her hair and will leave them in all day! I am participating in Cheri's Knock Off Knock Out party too.